Perhaps your corporate office has supplied your vehicle graphics for you to install locally. Or, your company represents a national manufacturer that has supplied you with their logos for your local service trucks. Sign-Age, and our installation subsidiary, Graphic Time, offers installation services to companies that already have graphics. 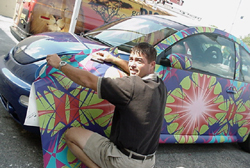 Whether you simply want to add a logo or wrap your entire vehicle with a custom, full-color design, Sign-Age can provide a solution that fits your budget and marketing objectives. Contact your visual communications representative for help.